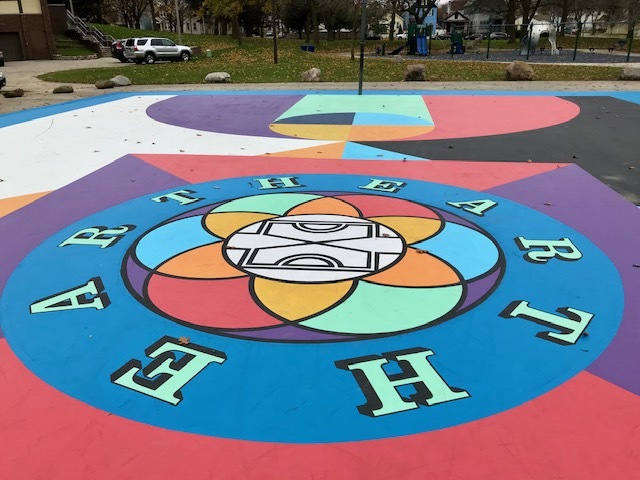 One of two basketball courts at Tiefenthaler Park now has a "floor" inspired by Robert Indiana&apos;s iconic 1977 MECCA floor. Published Nov. 8, 2018 at 11:01 a.m.
Last year, college student Joe Franke and founder of ActivakeMKE, whose mission is "to connect the community by activating people and unused space through the idea of sports and fitness, thus providing focal points where all can gather," put together a team to renovate the two ragged basketball courts at Tiefenthaler Park in the Midtown neighborhood. 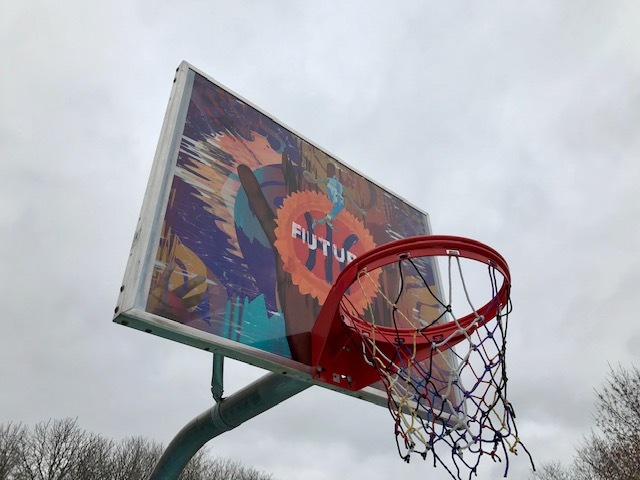 "We believe basketball brings people together in a powerful way," Franke told me last year when I wrote more in-depth about the project. "Milwaukeeans from all walks of life can coexist and share the experience through sport, music and art. "So, with this (project), we were lucky to take a step in the right direction. 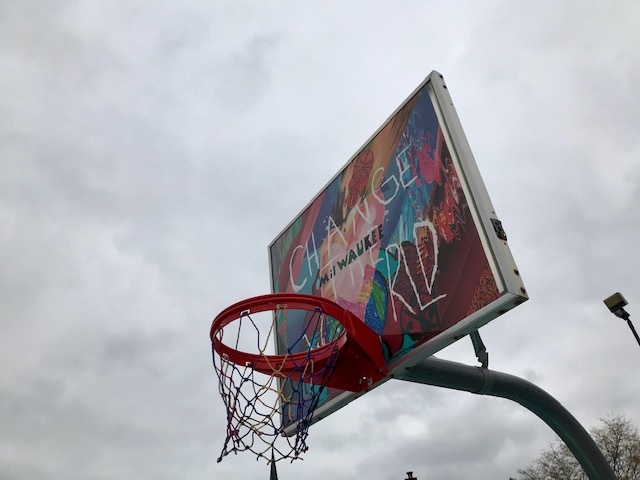 We updated the nets, rims and paint lines at Tiefenthaler Park. This is the first of many series of renovations to not only Tiefenthaler Park, but ideally more parks around Milwaukee. It will not only be basketball renovations, but bringing in art and music, as well." 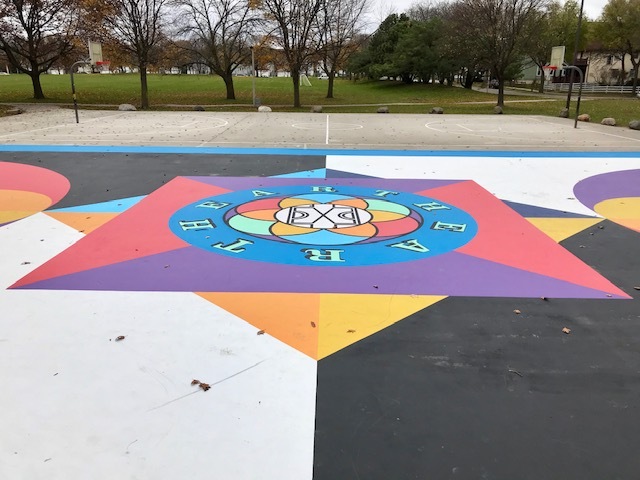 We went back to take a look now that the "floor" of one of the two courts has been painted, following a design by Steve Kodis, who said his work was inspired by the late Robert Indiana's beloved 1977 MECCA floor design for the Milwaukee Bucks. That design is back in the news thanks to new Bucks uniforms that were also inspired by Indiana's floor. Indiana died in May, about a week after his iconic "LOVE" sculpture was installed at the foot of Wisconsin Avenue as part of Sculpture Milwaukee. It looks pretty great, as you can see from these photos, and from the video below, posted to Instagram by Kodis.